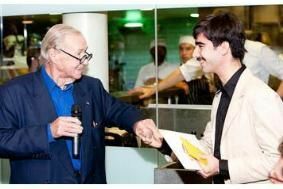 Sir Terence Conran presents Tivoli Audio design prize | What Hi-Fi? Santiago Ortega Haboud, a London-based Ecuadorian design student, came first out of the UK entries and third worldwide. Like all the entrants, he had to produce designs for a new Model 10 DAB radio to celebrate Tivoli Audio's tenth anniversary. He received $1000 and £500 of Conran vouchers at Sir Terence's Boundary Hotel in London. Santiago is currently finishing a design engineering post-graduate course at the Royal College of Art and Imperial College, London. Sir Terence said: "I have always been a huge supporter of education in design and competitions like this are an excellent way of encouraging students to get involved and use design positively. I love Santiago Haboud's 'Crayon' design – it's charming, clever and full of fun. He's a worthy winner." The global winner of the Tivoli competition was Malaysian student Huan Miao Khoo, whose design will be displayed on a giant billboard in Times Square, New York during December.